Pic of me and man in my avatar ! Thread: Pic of me and man in my avatar ! 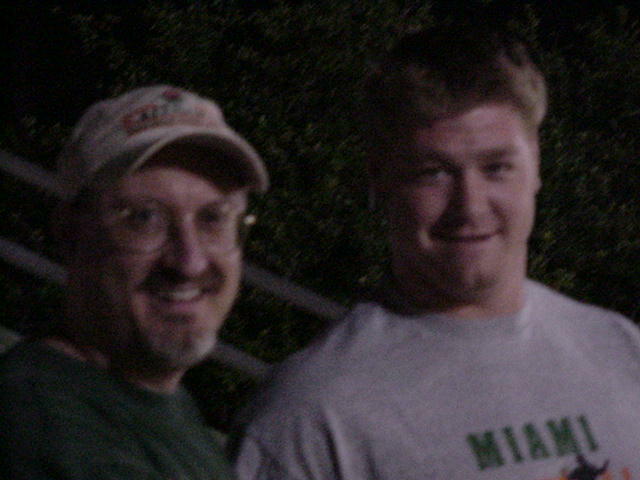 Sunday night while at the U of Miami baseball game with UCLA, I happen to spot Jeremy Shockey, the U of Miami Sr. TE, that caught a TD pass in the Rose Bowl National Championship game (the pic in my avatar is after he caught the pass). I also happen to be lucky enough to have my digi-cam with me at the game, and had someone snap this pic of me and Jeremy. Good god is he big.....6ft 5 and 265 lbs he said, and about 8% bodyfat. He told me he ran a 4.72 40 yard dash at the NFL combines in Indianapolis in February. And he almost matched that at a special workout the NFL had for the draft eligible players from South Fla in early March. He is supposed to be a top 10 pick in the upcoming NFL draft this April. As you know it's tough to get PT when you got a man like Jeremy playing. He's an awesome force and some team may have themselves a future Pro Bowler. That's a big boy Canes. I have a feeling after he is drafted, his new team will find a way to put another 20 pounds on him. With a 6'5" frame he could easily carry 285. I know he'll be an amazing athlete if with the right team, as always football being a team game, many times it makes a difference what team you play on. I also think that you are correct and he will be putting on at least 20 lbs. That would make him close to the size of an OLman, and he has improved his blocking skills since the off-season started, according to some of the scouts. I look for him to be a force in the NFL barring injuries. I see him around campus all of the time. He looks like a walking tree. yeah mckinnie is a MONSTER and his arms r loonnnggggg. i think shockey will be drafted 11-20 hes a GREAT football player but not top 10. Yeah, I think I've seen him a time or two at the games last year but didn't know who it was until this year. It's hard to miss a guy that is this big walking around the stadium, everyone's eyes seem to just follow him. I have met him, last year at the U of Miami radio program they used to have on WQAM, when they did the shows on Thursday night, Hurricane Hotline is the shows name. He was the guest and is truly an awesome sight. I am 6ft 2 and rarely feel *small* around someone....with Mr Mckinnie, I felt like a child once again, I had to look up so far to see him. I just hope he goes in the 1st round as expected. Miami should have at least 4 1st rounders this year and as many as 6, and might have a total of 13 drafted overall. I believe Miami already has more NFL veterans playing currently than any other school. hes diffently goin in the first round, i think theyll have 5 first round picks. we have a junior DE (HS ball) that is 6'6 260 lbs. he hasn't filled out at all either! he's gonna be a biggun!